PHILADELPHIA - A new video released in the case of a park ranger allegedly attacked by a skateboarder last month is causing speculation about just how the fight began, reports the Philadelphia Daily News. Erron Williams, a ranger at Philadelphia's Love Park, testified in court on Thursday that he did nothing to provoke 19-year-old Curtis Tanner on Aug. 15, according to the paper. He said he told Tanner and a couple friends that skateboarding was not allowed in the park and that they would have to leave. Tanner is facing assault charges in the case. A 17-year-old suspect whose name is being withheld was also arrested. Video evidence of the fight taken by a tourist appears to show Tanner punching and kicking the park ranger, who said he did nothing to return the violence. Williams, who is on the ground, can be seen trying to block kicks to his shoulder and head. "I'm not trying to have no confrontation," Williams testified during Tanner's preliminary hearing for aggravated assault and related offenses, the Daily News reports. "I can't touch him... I'm just trying to get him off me." However, a new, 15-second video of the incident was posted on Instagram eight days ago and appears to refute some of Williams's claims. 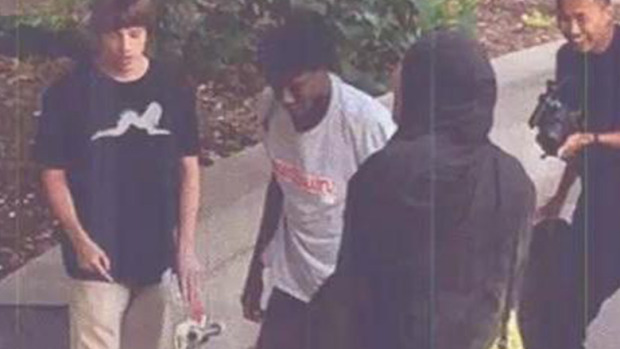 It shows two men, allegedly Tanner and Williams, trading punches near the visitors' center in the park. "I'm about to f--- you up!" the ranger shouts before getting into a boxing stance and throwing at least three punches at the teen. The Daily News reports the video was posted by @loveparkphiladelphia, and that it is unclear who maintains the Instagram account. The post has over 250 likes and is captioned, "lock em both up." Assistant District Attorney's Office spokeswoman Tasha Jamerson told the Daily News no one in her office had seen the video until the paper brought it to her attention Wednesday. "We will carefully review the video and all other information in this case and proceed accordingly," she said. Tanner is currently jailed on $10,000 bail pending a Sept. 25 arraignment, according to the paper. Williams has been a city park ranger since 2007.